Teenagers have recounted the horror of the crush at the Cookstown disco, saying “people were literally fighting for their lives”. Three young people died in the chaos – Lauren Bullock (17), Morgan Barnard (17) and Connor Currie (16) – all from Co Tyrone. Tributes poured in for the victims with descriptions for them that included “shining light” and a “beautiful soul. One young girl who was outside the St Patrick’s Day disco at the Greenvale Hotel told how people were “grabbing anything they could to pull themselves up to breathe”. She said she and her friends fell to the ground and became trapped under other teenagers in the queue. “It started with pushing and shoving, but everyone was still laughing and having a good time. Then the literal crushing started,” she said. The girl said she then fell to the ground. “But the thing about me was that I wasn’t on the ground, I was on top of someone, and this person was on top of someone else,” she said. “As I looked down, I could see multiple bodies underneath me and as I looked up I could see multiple bodies on top of me. “It was the most traumatic, frightening and stressful moment of my life. 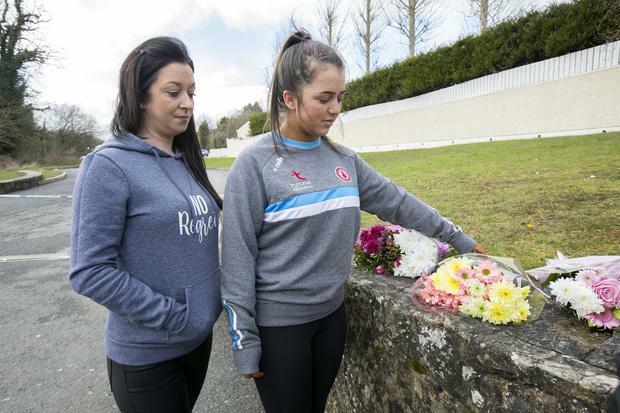 Lauren, a cheerleader from the small town of Donaghmore, was pronounced dead at the scene. Morgan and Connor, both pupils at St Patrick’s Academy in Dungannon, died later in hospital. "Everybody did their best for them last night, but it is a truly appalling incident. "Unfortunately, three are dead. The last person died this morning, unfortunately, with his parents near him." He said that, from his understanding, the event was not an underage disco, so a "full investigation will be carried out as to why the young people were there". Police urged parents to talk to their children and encourage them to come forward to describe what happened. Hundreds of young people had gathered for the disco and it is understood a number of people recorded footage on their phones. One such video, taken from inside the hotel, shows dozens of panic-stricken teenagers piled on top of each other at the entrance to the premises. Others are seen and heard desperately trying to escape the horror. Emergency services were on the scene within minutes of the alarm being raised on Sunday night. Another 16-year-old girl who was injured was in a stable condition in hospital last night. Two other teenagers were also treated for injuries. In the aftermath of the crush, owner of the Greenvale Hotel, Michael McElhatton, is reported to have administered CPR to the victims. In a statement last night, he said management and staff were assisting the police with their investigation. "We offer our heartfelt sympathies to the families and friends of the three young people who lost their lives. "Our thoughts are also with those who have been injured or affected in any way by this tragedy." Local SDLP MLA Patsy McGlone said a crowd of young people had gathered at the hotel to gain access to the disco, which was due to open its doors at 9.30pm. "But it seems that just before the doors were to open, at around 9.25pm there was a crush at the door and people began to fall," he said. "Youngsters going out for a disco on St Patrick's night. Everybody, their families, all thinking they are safe and well, and then the news turns differently." PSNI Assistant Chief Constable Alan Todd said a specialist team of detectives from the force's Major Investigation Team had been assigned to the inquiry. He urged young people who had been at the hotel to contact them to tell them what they saw. He said he could understand that there may be some reluctance to contact police by those who were at the event but underage, but added "please do not be concerned". "We are investigating the deaths of three young people, young people just like you. That is our focus. "We want to be able to give their families answers and your recollection of the events as they unfolded is crucial." In a statement issued last night, President Michael D Higgins spoke of the "shared grief of the people of Ireland at the terrible loss of life". "May I offer, in particular, my condolences to the families of the victims and to the pupils of the schools in Dungannon that I visited recently," he added. Meanwhile, the families of the Stardust victims sent their "heartfelt condolences" to the Tyrone families. Antoinette Keegan, whose teenage sisters Mary and Martina died in the fire at the Artane disco in 1981, said: "These innocent young people went out on a night like our loved ones - it is an absolute tragedy."